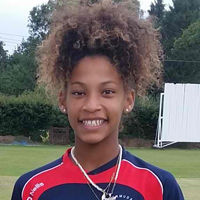 Bermuda’s Leilanni Nesbeth scored for ISFA U16 Girls national team as they defeated Cambridge City 7 – 0 at Huntingdon Town FC in the UK. The club’s match report said, “The ISFA U16 Girls national representative team got their season off to a perfect start with a spectacular second half display against Cambridge City. “The opening 30 minutes were very even with both teams creating plenty of chances and Cambridge City missing the best of those when they shot just wide of the post after a terrific through ball sent their striker through on goal. Just before the half hour mark Sophie Gillies pounced on a loose ball to finish well and give ISFA a narrow lead at the break. “Early in the second half Leilanni Nesbeth scored a screamer from 30 yards and this goal proved the turning point as the ISFA girls found their shooting boots and quickly raced into a commanding lead. Brogan Moore added ISFA’s third and fourth goals with two excellent finishes from outside the box, before Leila Emmerson produced the goal of the game, skilfully beating a player on the edge of the box before finding the top corner. Congratulations Leilanni continue to allow your Warrior Spirit to shine and may you always be an example to all young people. To your Nana and family, Bless you all. « Column: Why Bring Conferences To Bermuda?